2014 Chevrolet Cruze 1LT in beautiful "Atlantis Blue". 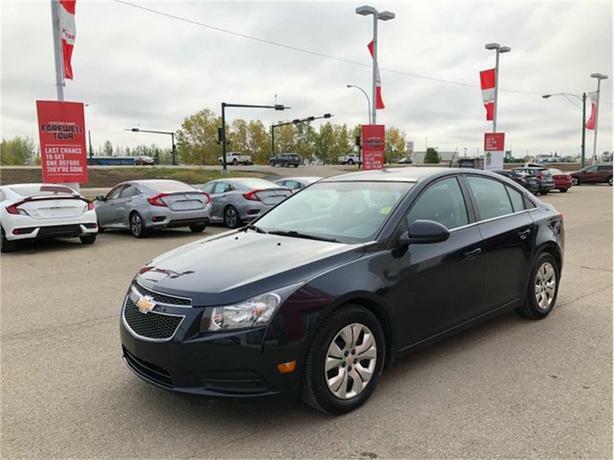 This Cruze has a 1.4L turbocharged Ecotec engine that will have you almost forgetting what a gas station is at 6.2L/100KM on the open road! The exterior and interior of this vehicle is clean and in excellent condition. This Cruze has been regularly serviced and maintained. For your peace of mind, our certified technicians performed an extensive multi-point, comprehensive used vehicle inspection on this vehicle. other than an oil & filter change and a few maintenance items, nothing more was needed to ensure this quality FWD is in optimal driving condition and more than ready for its next proud owners! This sedan is very clean and has tons of features to make your drive to work more enjoyable, such as; Remote key-less entry, steering wheel mounted audio and cruise controls, power windows with express-down and OnStar. You'll also appreciate staying safely connected with Bluetooth, and a dynamite 6 speaker stereo with CD/MP3, satellite radio, and auxiliary input. Our Chevrolet Cruze 1LT has been carefully designed to keep you and your precious cargo safe with innovative safety features including StabiliTrak Electronic Stability Control and ten airbags. A beautiful blend of efficiency, and style, this could be the best decision you'll make this year!